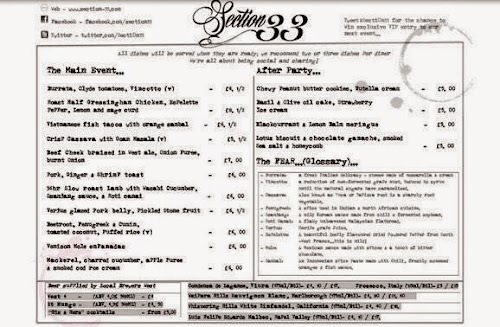 A few weeks ago I wrote about Section 33, a guerilla dining event that was heading to Glasgow. 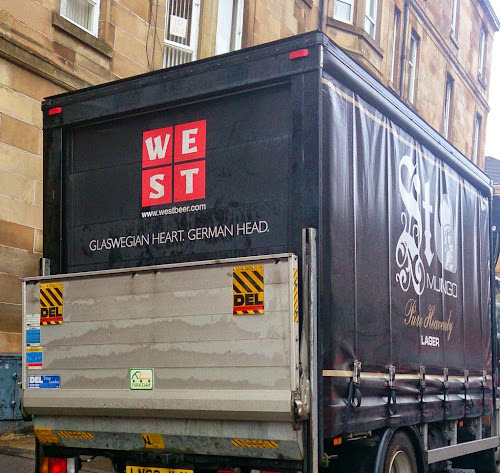 The menu and location of the dining extravaganza was a closely kept secret but last weekend over 800 of Glasgow's movers and shakers descended on Govanhill Baths to see what all the fuss was about. The story of Govanhill Baths has been much documented since Glasgow City Council decided to close the pool in 2001. 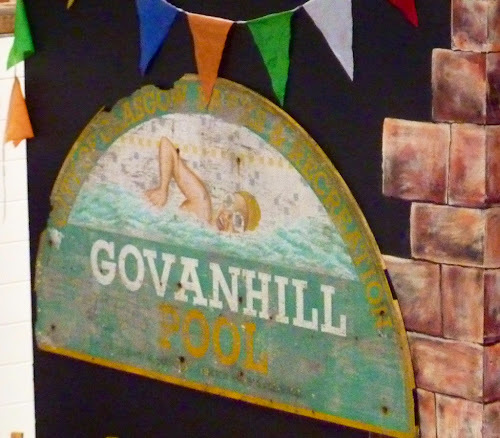 The pool was built in 1914 at a cost then of £14000 and was used heavily in those early war years by mothers as a wash house as many of the tenement houses lacked proper cleaning facilities at the time. 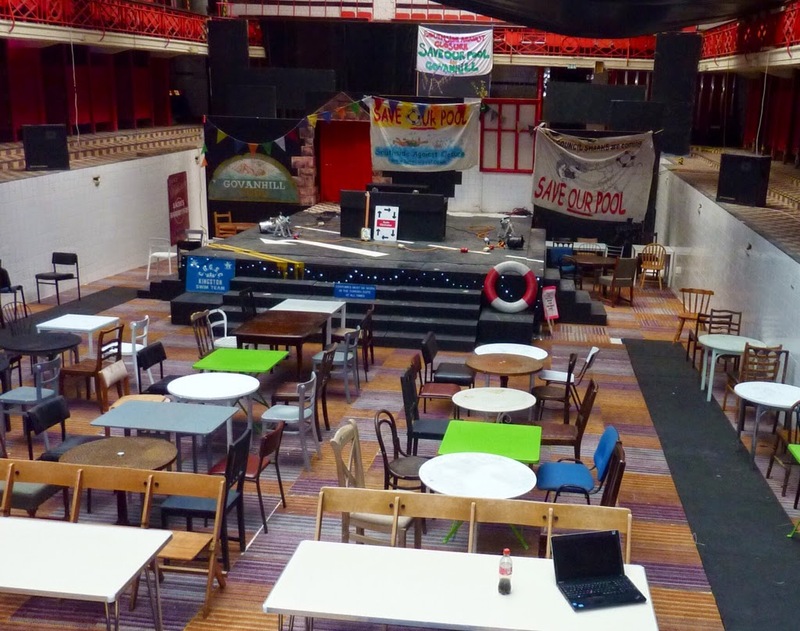 Over the years, the baths had been the hub of a growing multicultural community until it's closure. 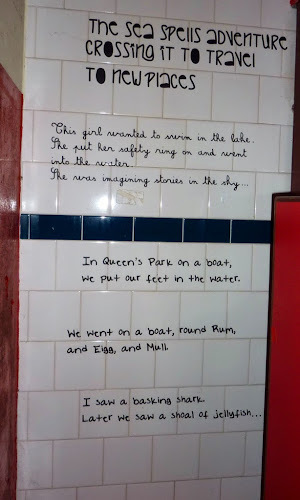 After heavy protests with supporters chaining themselves to changing cubicles on the eve of the closure, dawn police raids, and lengthy and protracted negotiation between supporters and the council, Govanhill Baths Community Trust submit business plans in 2005 that would allow them to reopen the Edwardian swimming pool and wash house as a community Wellbeing Centre. 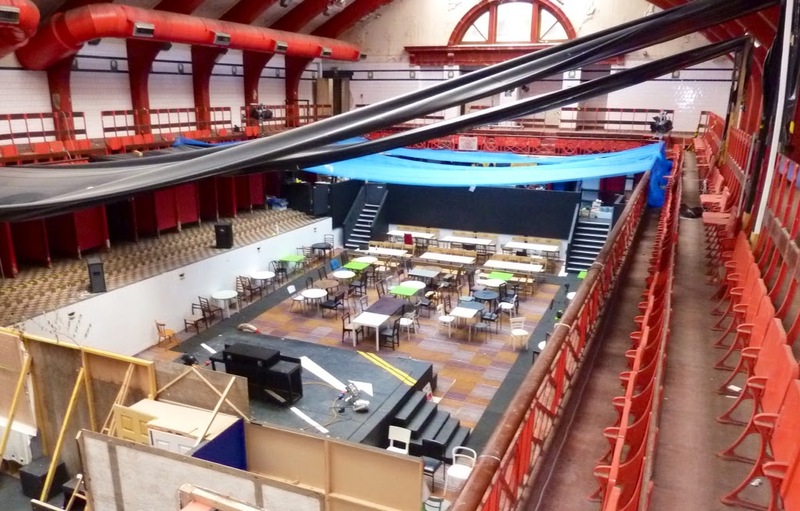 Until that day comes, The Trust are making use of the building by hiring out space on an ad-hoc basis to local clubs and associations, and as of last weekend - Section 33! We took a trip down to Govanhill on the Friday morning to get a look at the work ahead of the team. We arrived just in time to see the local brewery WEST make a important delivery of their fantastic St Mungo & West4. 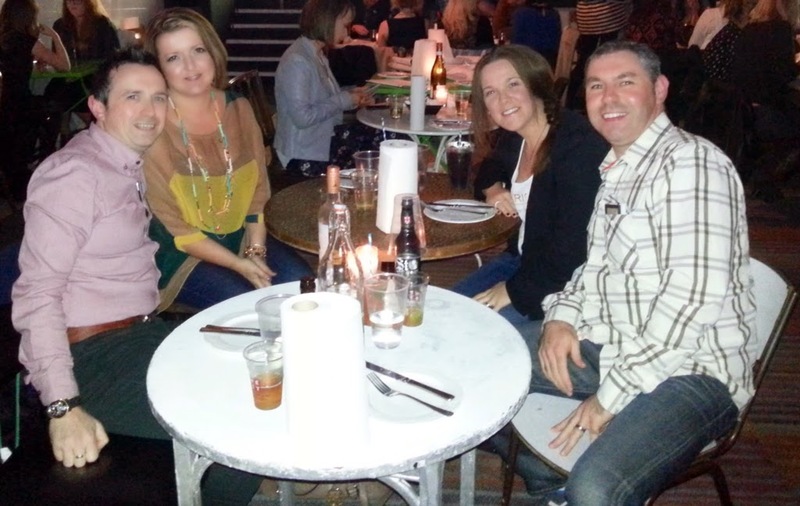 The swimming pool area was transformed into a makeshift restaurant seating area with a stage at 'the deep end' for the live entertainment that would accompany the fine dining experience over the weekend. It's hard to believe that the heart of this Edwardian building is very much as it was when the doors were closed back in 2001. 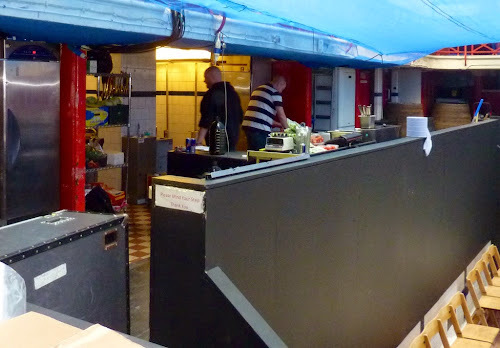 It seemed crazy to think that in less than six hours that diners would be tucking into high end cooking. Chef Chris and his team were busy trying to organise their cooking area. I did manage a quick word but I felt that I was just getting in the way so left them to it. The inside of the old changing cubicles were adorned with various pieces of graffiti and poetry. I would love to know who penned these words. We had purchased our tickets weeks earlier and were really looking forward to heading to Section 33 with friends Lisa and John last Saturday evening. The menu was adventurous with each of the dishes promising big (and sometimes unusual) flavours whilst a huge element of chef skills would be needed to make sure that the menu didn't fall flat. 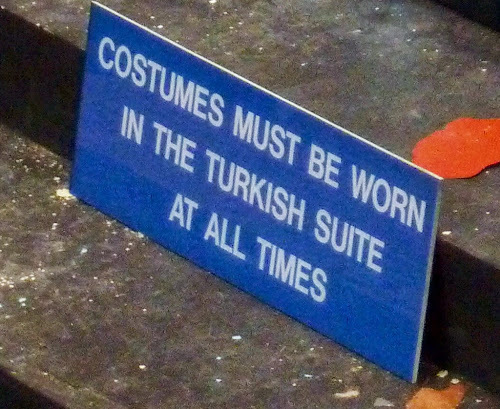 The dress code for the evening was casual, although you the guys at Section 33 did have to draw a line somewhere. We were advised that the small plates were ideal for sharing and recommended that 2 or 3 plates per person would ensure that no one went hungry. The four diners at our table had fairly similar tastes in food which meant that we ended up duplicating some of the plates, with myself and Nicola sharing five dishes plus a couple of puddings too. 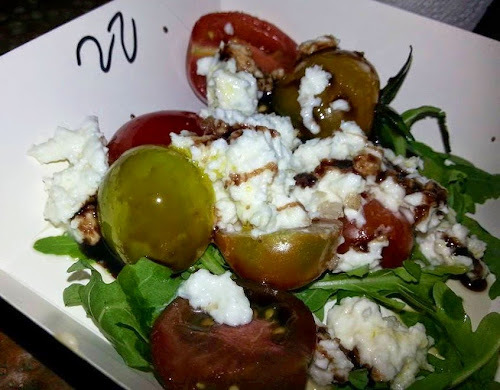 First to arrive was Buratta with Clyde Valley Tomatoes, and vincotto - the creamy mozzarella and juicy tomatoes were balanced wonderfully by the sticky sweet grape musk reduction. Next up was my favourite dish of the night. Beef Cheek braised in West ale with onion purée and burnt onion. The beef was so tender, falling away at the slightest pressure from my fork, and balanced perfectly with a rich onion purée and the cutest little fondant potato. 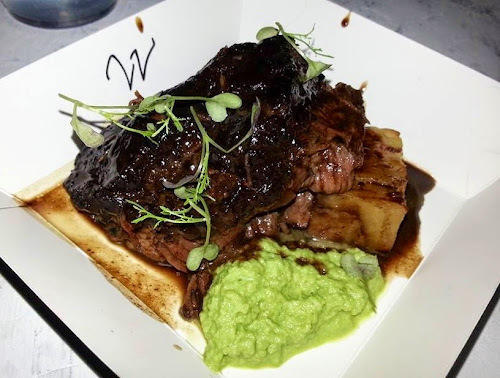 I love beef cheek and based on the quality of the cooking, I could easily have eaten another portion with little hesitate. This was my favourite dish on the night. We had all given thought to the half roast Gressingham chicken but myself, Nicola and John didn't want the hassle of picking the meat from the bones, however this didn't stop Lisa as she happily tucked into the crispy skinned bird. 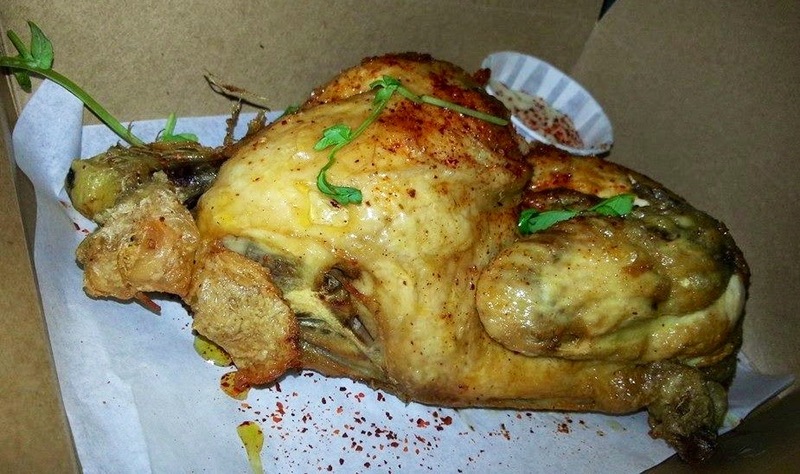 The chicken was seasoned with lemon, sage and Espellete peppers before being roasted, such was the quality of the cooking that Lisa had no problem getting the juicy meat from the under the crispy, fragrant chicken skin. I have to admit to being a little jealous as I watched her strip ........ (the chicken down to the carcass). 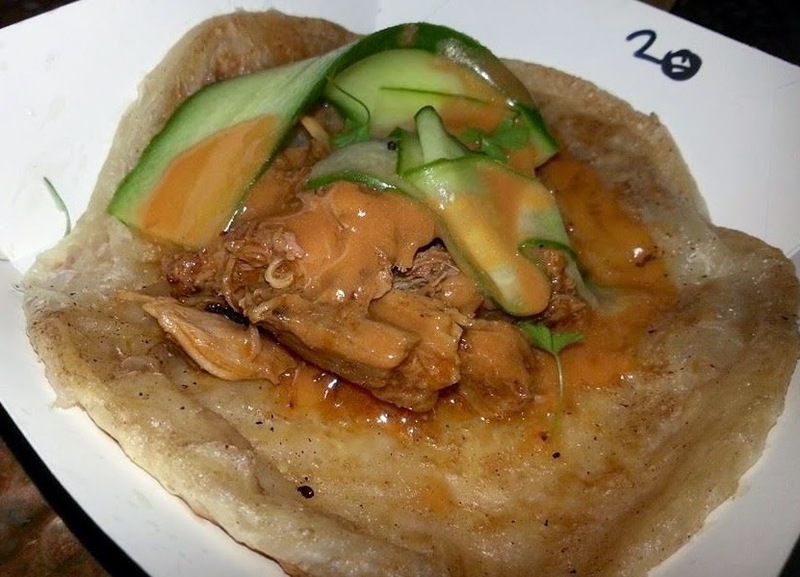 Next up was a creative dish of 36 hour slow cooked lamb with wasabi cucumber with roti canai. The lamb was deliciously tender and well flavoured with oriental spices then served on a flaky Malaysian flatbread. We both love lamb and this clever combination didn't last very long at our table. The last dish to arrive at the table was the Venison Mole Empanadas. Mole is a Mexican sauce made from spices and bitter chocolate. The mole was blended with venison before being wrapped in rich butter pastry then deep fried. 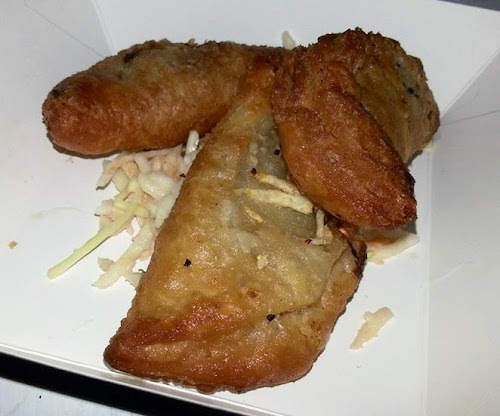 We had been advised that the Empanadas were one of the most popular dishes over the weekend and whilst the flaky pastry was very light and tasted fantastic, it was difficult to identify the strong venison flavours within the parcel. Don't get me wrong, I enjoyed the empanadas but without the menu, I would have struggled to to tell you what the filling was. Shame as I love venison! Wth the mains all hitting the spot, it was time to order some pudding. Again the menu made sure to give enough options with four desserts to choose from. 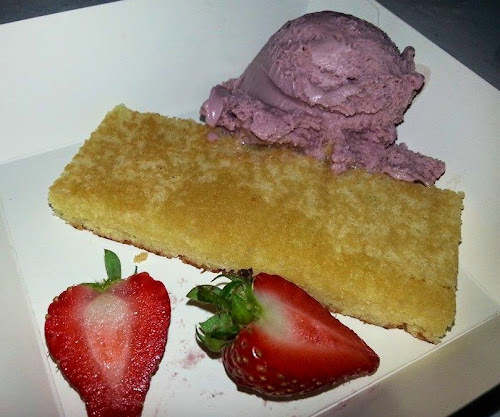 The first dessert that arrived was a fantastically light basil and olive oil cake with strawberry ice cream. I first tasted olive oil cake at Angels With Bagpipes in Edinburgh and loved it. The cake that came out of the Section 33 makeshift kitchen was every bit as good as the one I'd had from a professional kitchen. 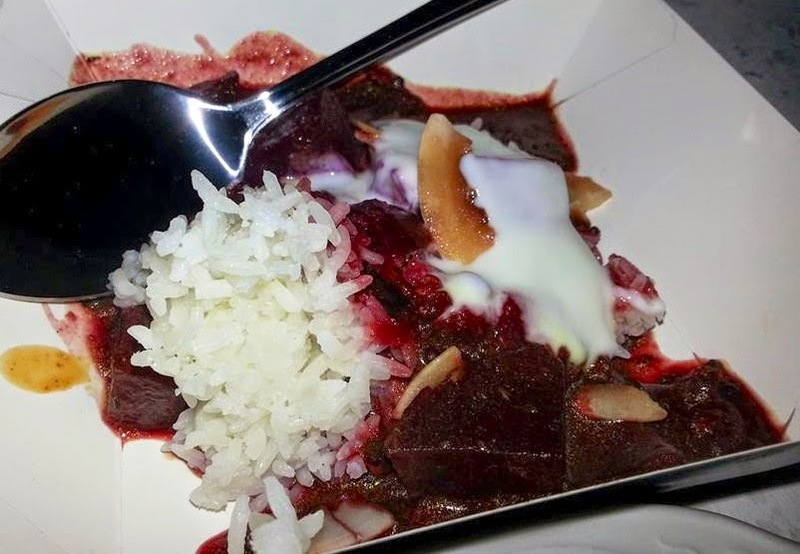 What made this dish stand out though was the creamy strawberry ice cream that was bursting with fresh berry flavour and could easily have managed a few more scoops. The show stopper for the four of us was the lotus biscuit & chocolate ganache with smoked sea salt and honeycomb. Wow! I don't think that I've ever eaten a better chocolate dessert. 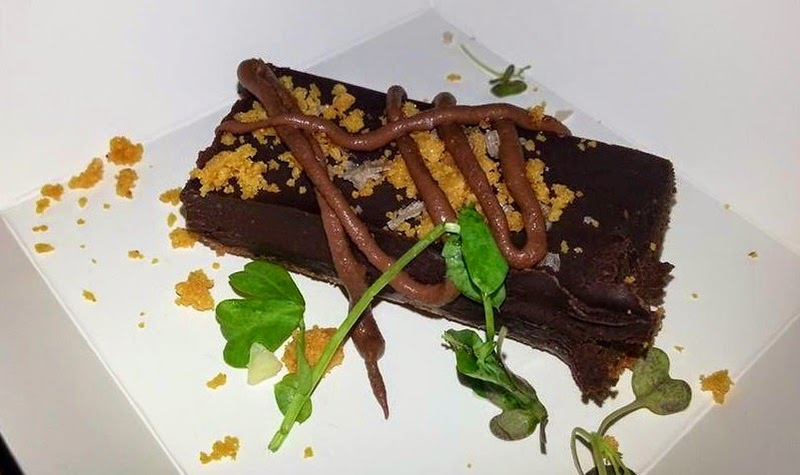 The ganache was silky smooth and so rich but the scattering of crunchy honeycomb added texture whilst the smoked sea salt turned this dessert into a very delicious guilty pleasure. The only slight negative was that an Edwardian public bath house with no water or heating can get get a little cold, especially in the first weekend of October, but there was no way that the chill in the air was going to take the shine off of what was a very good night. The food, drinks and service were all of a standard that was far higher than we expected considering the dilapidated venue, and great value for money with dinner for the four of us costing £120, including a bottle of wine and a few beers. So to sum up the very first Section 33 guerilla dining event, we had a fantastic evening with every scrap of food being hungrily devoured, and we cannot wait to see where and when Section 33 pop up next. Rest assured, we will be at the front of the queue! 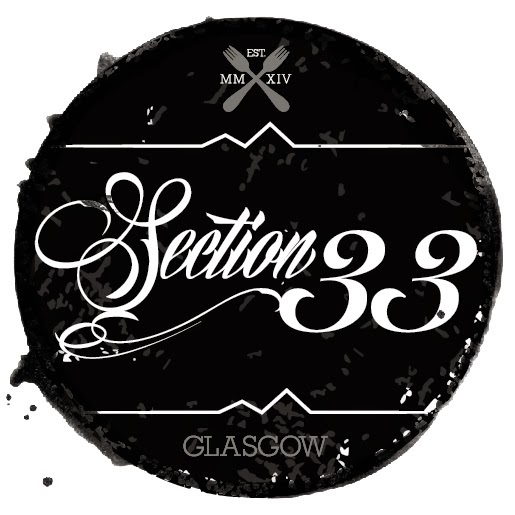 Make sure that you don't miss out on the next Section 33 event by checking out their Facebook or Twitter pages.